My friend Joel hosted his annual Meatluck this past weekend. His meatluck parties are always a bonanza of an evening, and any meat-lover and first-rate carnivore will find themselves in Heaven for just one night. The rules? Simple. Bring a dish that contains meat in it, no matter what course you're assigned. Yes, even dessert. I've been to the previous two Meatlucks (you can read about them here and here). The dishes and the course you're assigned may always be different. But you're always guaranteed the same thing: fantastic, creative foods, LOTS of food, flowing wine, great company amongst fabulous friends, old and new, and a wicked meat hangover the next day. This year I was tasked to bring an appetizer. With so many options to choose from, it was hard at first to decide what I wanted to make. But with a recent obsession with cream puffs, which I tried from Jacques Pepin's new cookbook, Essential Pepin, I knew I wanted to make a savoury pâte à choux. The puffs are surprisingly easy to make, thanks to the use of a food processor. And they are oh-so-buttery and creamy and light as a cloud! To make the beef: Preheat an oven to 425ºF. Using kitchen string, tie the beef at 1-inch intervals along the length of the roast, drizzle and rub olive oil all over, and season generously with salt. 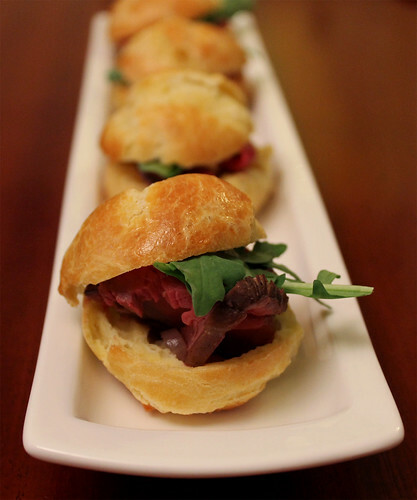 Arrange the peppercorns on a large plate in a thin layer and roll the beef in the peppercorns to coat evenly. In a large ovenproof fry pan over high heat, warm some olive oil until nearly smoking. Carefully place the beef in the pan and brown, about 3 to 4 minutes per side. Transfer the pan to the oven and roast until an instant-read thermometer inserted into the center of the meat registers 125ºF for very rare to rare, about 20 minutes. Transfer the beef to a platter and let cool to room temperature. Wrap the beef tightly with plastic wrap and refrigerate until chilled, at least 4 hours or up to 2 days. To make the pâte à choux: Preheat the oven to 350ºF, with a rack in the centre. Combine the milk, butter, and salt in a saucepan and bring to a boil over medium heat. Immediately remove from the heat, add the flour all at once, and mix it in with a wooden spoon. Return the pan to the stove and stir over medium heat until the mixture comes away from the sides of the pan and collects into one soft lump about the consistency of modeling clay. Cook for about 1 minute, still stirring, to dry the mixture further, then transfer to a food processor and process for 4 to 5 seconds to cool the mixture slightly. Beat the eggs in a bowl with a fork until well mixed. Reserve 2 tablespoons of the beaten eggs to brush on the puffs and slowly drizzle the remaining eggs to the dough mixture, with the food processor running. Process for 20 to 30 seconds, until very smooth. Line two baking sheets with parchment paper. Scoop a heaping soup spoon of the dough between 2 spoons to help shape it into a round ball and pace on the sheet, spacing them them evenly to allow for expansion. You should be able to fit 12 choux on 1 sheet. Brush with the beaten egg to smooth the tops and coat the surface of the balls. Bake for about 40 minutes, until the puffs are nicely developed, browned, and cooked through. They should hold their shape but still be soft. Turn off the oven and open the door halfway and let the puffs dry for 10 minutes in the oven. Set aside in a draft-free area to cool and repeat with the second tray of puffs, remembering to preheat your oven first. To make the onion marmalade: Heat the olive oil in a large, heavy saute pan over medium heat until hot. Add the onion slices and stir to coat. Add the thyme, salt, and a few grindings of black pepper. Cook the onions until they begin to soften, then turn the heat down to low. Cook the onion mixture, stirring occasionally, until the onions have cooked down and have a very soft, sticky, marmalade texture, about 45 minutes. To make the horseradish cream: Stir the crème fraîche and horseradish together. Refrigerate until ready to use. To assemble: With a very sharp knife, very thinly slice the roast beef. Place the slices onto a plate. Cut the puffs in half. Spoon 1 teaspoon of the onion marmalade on the bottom of the puff. 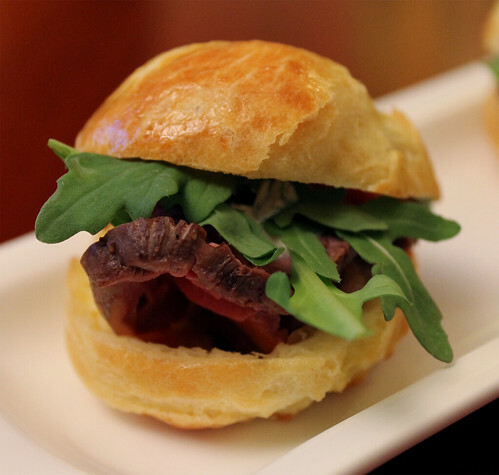 Top with a slice or two of beef, a dollop of horseradish cream, and one or two arugula leaves. Top with the top half of the puff and repeat with the remaining puffs. 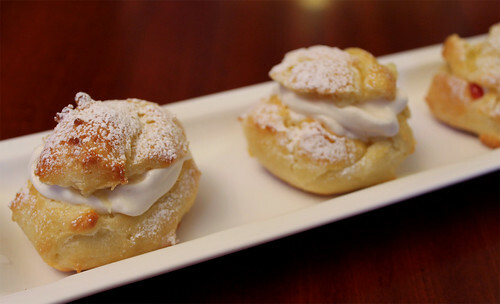 Serve the puffs within 2 hours of assembling, otherwise the choux pastries will go soggy. Melody Fury // GourmetFury.com November 25, 2011 at 6:14 p.m.
Those look stunning! mmm... I could eat a dozen.